When it comes to One Piece, I am a huge fan. Off the top of my head I don’t think that I could name an anime series that I like more. But something has been bothering me about One Piece lately. It is a problem that I wanted to ignore but with each week that goes by, it grows more apparent. 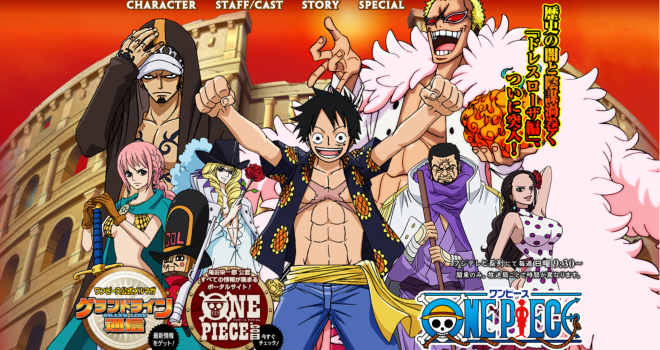 Right now One Piece is experiencing a problem with pacing and it is a problem that has been here for awhile. Unfortunately it is really lowering my enjoyment of the the series. I feel like pacing is an issue in a lot of anime, so this isn’t uncommon. Even though it is a common flaw, One Piece is struggling with it very badly at a time where it really shouldn’t. Right now, One Piece is in the Dressrosa arc, an arc that has some of the most intriguing characters in the series, with Doflamingo, Law, and Sabo to name a few. There are so many interesting backstories that are associated with these characters. I really can’t remember an arc that has had this much “star power”, at least in terms of individual spotlight. The variables are all present in a favorable configuration but the story keeps experiencing stunts in its progression and can’t seem to take advantage of it. Just last week, the episode ended with Sabo about to enter the final battle at the coliseum, it built so much hype going into this week’s episode. Unfortunately that hype didn’t translate into a good episode and nothing really happened. That is how this arc has been though; cliffhangers and then nothing the following week. It also doesn’t help that nearly five minutes of the episode is taken away every week, by an unnecessarily long intro and recap of the previous episode. They aren’t leaving much room for the story to unfold. While there have been some really awesome episodes, they have been scarce and were followed by weeks of Rebecca fan service, that did little to progress the story, and focus on characters that weren’t really important at all. It has gotten to the point where I am not really all that excited for the new episodes, because I feel like I could skip them, and I wouldn’t miss anything important. I am strongly considering jumping ship to the manga. I love the anime but as much as I want to stick around, I am growing impatient. While One Piece has always progressed slowly, it was usually done in a semi-elegant manner but ever since the time skip, that hasn’t been the case. The One Piece anime is now riding on the waves of a stormy sea; the story progression has been anything but smooth sailing. After the Fishman Island and Punk Hazard arcs, which were the weakest arcs in the series thus far, the Dressrosa arc had the potential to be the best arc yet. While it still has the potential, they will really have to turn things around for that to happen. As a fan it’s frustrating because I know how many awesome things are around the corner. They need to stop swashing around and start setting the sails on this story already. It’s time.